Nous sommes amoureux de cette maison et sa situation. A l' été prochain ! Bonjour à Wim, Joliza et Ella ... Vous êtes dans notre coeur ! 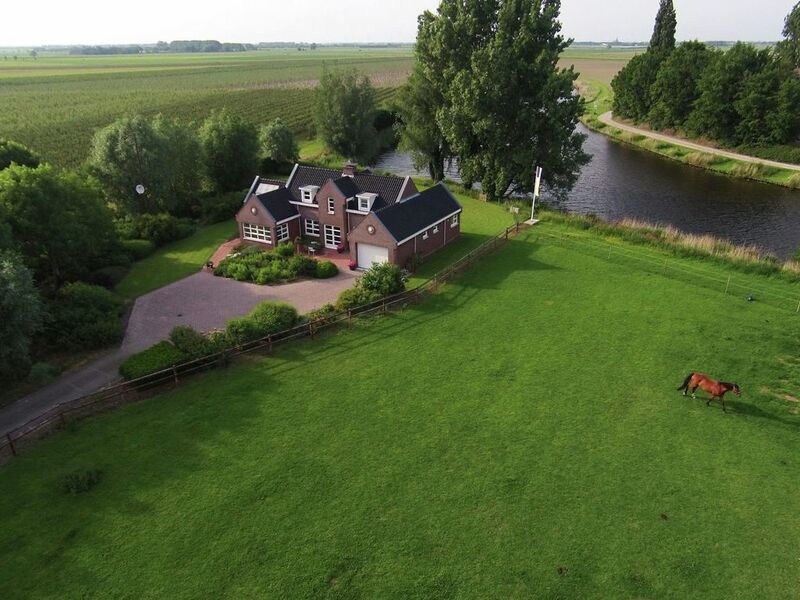 A stylish, spacious Dutch retreat! Wow. This rental was a dream. It was the last of 3 rentals we had while touring The Netherlands for 2 weeks and by far the most spacious and serene of them all. The photos are exactly what you see when you get to Logement De Blauwe Sluis--an entire house, decorated with high-end, yet comfortable furnishings in the tranquil setting of a farm and river. We were a family of 6 and had plenty of room: enough bedrooms, baths and dining & living areas. The first floor has so many windows so the house is always flooded with light and you really feel a part of the surrounding countryside. We ate here every night and having a full kitchen was really convenient. (No microwave, but we managed just fine.) Our kids loved being able to run around outside on the large lawn and driveway. The horses in the pasture next to the house were very friendly. And having a full washer/dryer was so handy! The house was spotless and the owner was so nice, always answering any question we had very quickly. We stayed here while attending the Redhead Days festival in Breda over a 3-day weekend. One of the days was very rainy and windy so we decided to skip the festival and just relax at the Blauwe Sluis--it was THAT relaxing! It's also an quick drive to Roosendaal where there's plenty of shopping, dining & outlets. From Roosendaal we caught the train to Breda for a day trip which was very convenient. It was really special to leave the city after a day of touring and come back to our pastoral retreat. We'd stay here again in a heartbeat! We used the property as a base to explore the surrounding area, including Amsterdam, The Hague, Gouda, the Kroller-Muller museum in Otterlo, and the windmills in Kinderdijk. We also took advantage of the free use of the two very well maintained bikes that came with the house. And we enjoyed the conveniences offered by the quaint village of Steenbergen, about 5 minutes away by car. The house was largely as pictured. The main living area on the ground floor, the bedroom with its own bathroom on the ground floor, and the bedroom with its own sink on the first floor all seemed bigger than the pictures. The small bedrooms on the first floor seemed smaller than the pictures, but were adequate for sleeping and had a sitting area in the hallway outside. We especially enjoyed learning about life in the area from Jolisa -- she was a most helpful and informative host. Fijn licht, schoon huis in prachtige omgeving. Gastvrij vriendelijk ontvangst. Allemaal folders aanwezig over bezienswaardigheden in de omgeving. Grot huis met veel ruimte in en om het huis. Mooie omgeving.